Planning | Overview | Daikin Lubrication Products & Engineering Co., Ltd.
Having a good understanding of the bearing specifications for determining the lubricating amount and the layout of the bearings to be lubricated for determining the distributing valve connection method is a basic element of system configuration. The lubricating amount varies according to bearing specifications (type, load, clearance, sealed state, etc. ), environmental conditions, and other factors. When the bearing specifications of the machine to be lubricated are clearly known, consult with us or your agent. (Note) When actual operation of the lubricating system is started, thoroughly observe the lubrication status and adjust the lubrication interval. Look over all of the bearings to be lubricated by centralized lubrication (simply called “lubricating ports” from here on), and group them by individual lubricating ports that are located relatively close to each other. 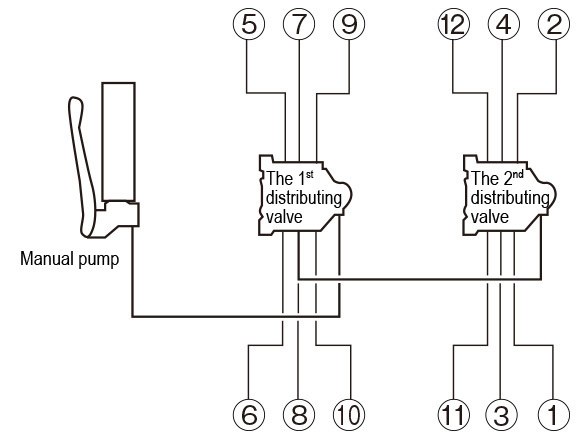 In the case of equal quantity lubrication, select a distributing valve that has a number of discharging ports matching the grouped number of lubricating ports. 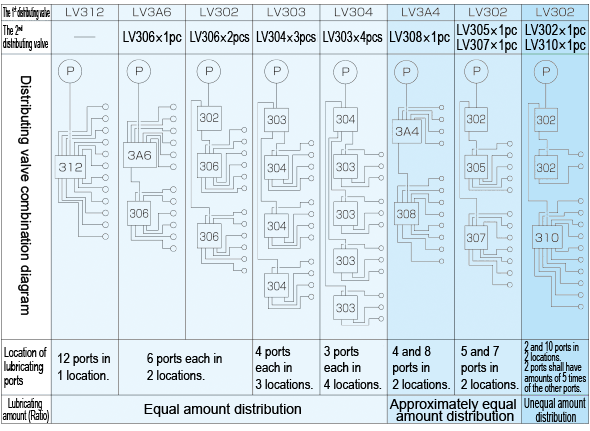 In the case of unequal quantity lubrication, the discharging ports of the distributing valve sometimes must be grouped or a distributing valve having a discharging port factor of 6 sometimes must be selected. For this reason, consult with us. Note) For details on the definition of oil lubrication ratio, refer to the “Example of Number of Lubricating Ports, Distributing Valve Combination Table” on pages 14 and 15 of the catalog. • Generally a manually operated pump is used in the case of a system having a relatively low lubrication frequency (once a week or less) and a small system quantity requirement (total discharge quantity of 12 distributing valves approx. 1.56 cm/lubrication). On the other hand, when automating the main machinery or when there is a high system quantity requirement and lubrication is performed at a high frequency, select a motor driven pump. • When lubricating with grease, a cartridge type pump is recommended. However, when it is difficult to obtain a cartridge container filled with the type of grease you use, adopt a follower plate type pump. 1-cycle oil feed system ... With this system, 1-cycle operation of the indicator is detected by the detection switch (option) to control the motor driven pump. Multi-cycle oil feed system ... With this system, the number of cycles of the indicator is measured by a counter, for example, and the motor driven pump is controlled by an arbitrary number of cycles. This pump operating time oil-based feed system controls the pump operating time by a timer to obtain the discharge quantity for the system quantity requirement (i.e. total lubricating amount). Generally, when there are few lubricating ports and the lubricating amount per port is low, the 1-cycle oil feed system is used. 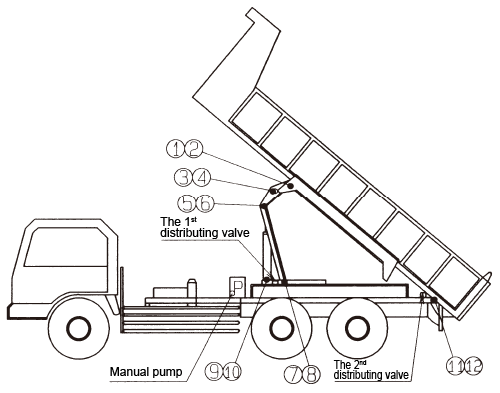 When there are many lubricating ports and the lubricating amount per port is high, or when the bearing structure is special that requires sealing with grease even with a small number of lubricating ports and ambient environmental conditions are poor and a large lubricating amount is required, the multi-cycle oil feed system is used. 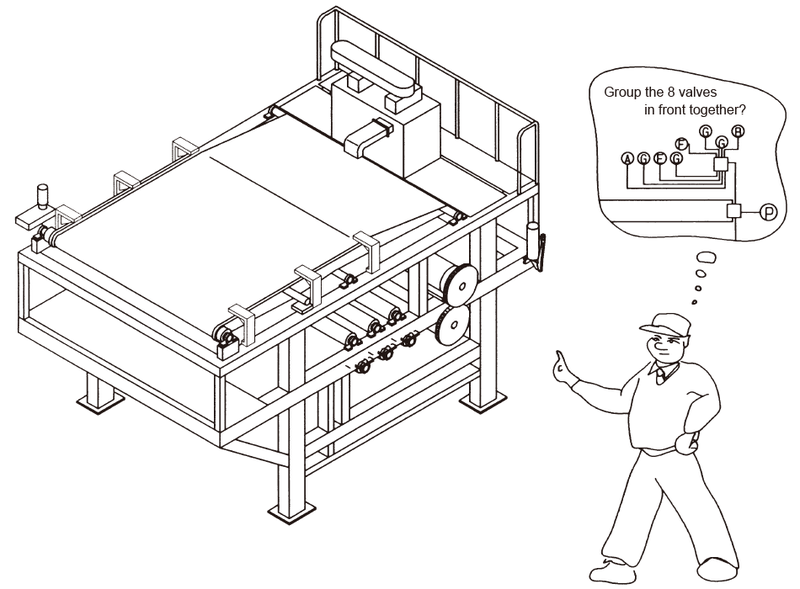 When a controller capable of handling a multi-cycle oil feed system and pump operating time oil-based feed system is needed, consult with us.